Azzan in Anvil wants you to see Arvena Thelas regarding a rat problem in her basement. Speak with Azzan; he claims to have a job that's perfect for you. Head over to Arvena's house and ask her about her rat problem. Go down to the basement to discover and kill the culprit. Afterwards, head back to Arvena and speak with her again. Find Pinarus Inventius and go hunting. Return once again to Arvena to find your excursion wasn't very successful in solving her problem. Follow Arvena's unknowing suspect around Anvil, watching for suspicious activity. Once you catch the person responsible, make a decision that will determine what reward you receive. Speak to Azzan about Contracts then Rats to receive this quest. He claims that Arvena Thelas is having a problem with rats in her basement, but refuses to provide specifics. He says that you'll just have to go over to see for yourself. You can find Arvena in her house, which is just west of the north gate. When you talk to Arvena, you'll learn her "rat problem" isn't exactly what you would have thought it to be. Apparently, she loves rats and keeps some as pets. Lately, she has been finding them dead. It is now up to you to find out what's been happening. Head down to the basement where you should find a starving mountain lion attacking the rats. Kill the lion and then report back to Arvena. She'll ask you to find Pinarus Inventius, a hunter whose house is just on the other side of the road. Speak to him and follow him outside the city. Kill all four starving mountain lions and go back to Arvena. When you return to Arvena, you'll learn that there is yet another lion in the basement. Kill that one and go back upstairs. Arvena will tell you that she suspects that her neighbor Quill-Weave is responsible. She says that Quill-Weave has never liked her rats and has been sneaking around Arvena's house at night. If you talk to Quill-Weave, she'll deny any involvement. You're going to have to catch her in the act to make her confess. Quill-Weave will go into sneak mode around 8 p.m. and head for Arvena's house. 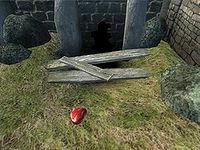 You can lie in wait for her there or follow her around Anvil till she gets there, if your Sneak skill is high enough. She drops some meat next to the hole into Arvena's basement, and you'll get a journal entry; talk to her after that and the truth will come out. Quill-Weave says that she didn't mean to lure the lions inside; she was just trying to lure the rats out so that the guards would kill them. You can decide whether to keep her secret or not. Tell Arvena that Quill-Weave had nothing to do with it, and Quill-Weave will give you a free one-level boost in Acrobatics. Tell Arvena that Quill-Weave was behind it, and Arvena will give you a free one-level boost in Speechcraft. Quill-Weave will still be available as an Acrobatics trainer but she'll call you a "rat" every time you speak with her, no matter how high her disposition is toward you. Whichever option you choose, Arvena gives you the same level-dependent gold reward and your Fame is increased by one point. If this is the first Fighters Guild quest that you have completed, return to Azzan for promotion to the rank of Apprentice. Following the completion of this quest, you can return to Azzan for another Fighters Guild quest, The Unfortunate Shopkeeper; or you can instead go to Cheydinhal and get the quest The Desolate Mine from Burz gro-Khash. Kill the mountain lions in the basement quickly; if all the rats get killed, Arvena won't need your services anymore. This also happens if you kill all the rats before obtaining the contract. The quest will be completed but you will get neither Fame nor free skill training. Even if all the rats are killed though, you will still be ready to be promoted to Apprentice rank without completing any additional quests. Quill-Weave sometimes leaves Anvil to visit Chorrol. It's a good idea to use your quest markers and world map to see where she is, since there's no point in waiting outside her home if she's in Chorrol. If she's gone, she'll usually be back the next day. For the first Fighters Guild quest in Morrowind, there is a lady who has a rat problem of a different sort. Perhaps coincidentally, her name is Drarayne Thelas. 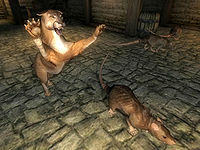 Quests involving rats have been a running theme for early involvement in the Fighters Guild since Daggerfall. This is also implied by a rumor heard in Anvil after the quest is initiated: "It's always 'rats' for the new associates. Is it some initiation test or something?" Quill-Weave refers to the meat that she leaves as rotten, but it is identical to any other that you might find. If you are in a rush, you can kill the lions yourself before Pinarus arrives at the location; he takes a long time to get there. Note that doing this will trigger a minor bug and make Pinarus wait for you indefinitely. As a result, he will not be available for training before you have led him to where the mountain lions are, even after the quest is completed. After reaching the Quill-Weave portion of the quest, she will place meat next to the hole night after night, and it will accumulate. Speaking to Arvena Thelas before undertaking the quest while she is sitting on the bench outside her house may break the quest, causing her to never return to her house. A possible fix may be to break into Arvena's house. From inside, make the quest active. Open the console and use the command: getstage FGC01Rats. The returned stage should be 10.00. Then use the movetoqt command. You should appear outside Arvena's house, with Arvena standing right in front of you. Alternatively, you can strike Arvena and allow yourself to be arrested. When you return to her home, she will have reappeared upstairs. She may also return on her own after you wait or sleep. It is possible for Quill-Weave to become stuck in Chorrol during her visit to Casta Scribonia. Entering Casta's house should make Quill-Weave exit and make her way back to Anvil. 10 Azzan has told me of a contract in Anvil with Arvena Thelas. I should speak to her about a problem with rats in her basement. 20 Arvena Thelas has rats in her basement, but they're not the problem. She loves the rats, but she's been finding them dead. She would like me to go down and investigate what's been happening. 30 I've killed a mountain lion in Arvena Thelas' basement. They must be sneaking in through a hole in the wall somewhere. I should tell Arvena what has happened. 40 Arvena Thelas was glad to know what was killing her rats, but she still doesn't feel safe. She'd like me to speak with Pinarus Inventius about hunting down mountain lions in the area. 50 Pinarus has agreed to look for mountain lions with me. If we find them, we'll kill them, and make Arvena feel safer. 55 We've killed all the mountain lions Pinarus believes are in the area. I should return to Arvena Thelas. 60 I've told Arvena about the mountain lions, but she doesn't believe her problem is solved, as there's a mountain lion in her basement now. I'll have to kill it. 65 I've killed the second mountain lion in Arvena Thelas' basement. I should tell Arvena. 70 Arvena now believes that her neighbor, Quill-Weave, might be responsible. Arvena has seen her sneaking around outside the house at night. I should watch Quill-Weave and see what she's doing. I should not let Quill-Weave see me, though, lest she get suspicious. 80 I've seen Quill-Weave leaving meat outside Arvena Thelas' house. This must be what is attracting the mountain lions into town and into Arvena's basement. I should confront Quill-Weave. 90 I've confronted Quill-Weave, and she has admitted to trying to kill off Arvena's rats. She has promised to stop, and has asked me not to tell Arvena what she's done. 100 Finishes quest I've told Arvena Thelas what Quill-Weave has been doing. She thanked me for my help, and has paid me for the contract. She's also taught me a bit about Speechcraft. 105 I've told Arvena Thelas that the problem has been solved, and she has paid me for the contract. I should see Quill-Weave and tell her I've protected her secret. 110 Finishes quest Quill-Weave thanked me for protecting her secret, and has trained me in Acrobatics for free. 200 Finishes quest All of the rats in Arvena Thelas' basement are dead. I've failed my contract. It is possible to use the console to advance through the quest by entering setstage FGC01Rats stage, where stage is the number of the stage you wish to complete. It is not possible to un-complete (i.e. go back) quest stages. See SetStage for more information. This page was last modified on 26 December 2018, at 11:15.